Full-timing in Oregon. Arctic Fox or Avion? I always liked the Arctic Fox or look into Big Foot. The Arctic Fox usually has a bath tub too. Easy maintainence and polar package to insulate well is what you will appreciate in day to day living. I loved the idea of an old airstream or avion and gutting it out to my liking and putting in a little wood stove. 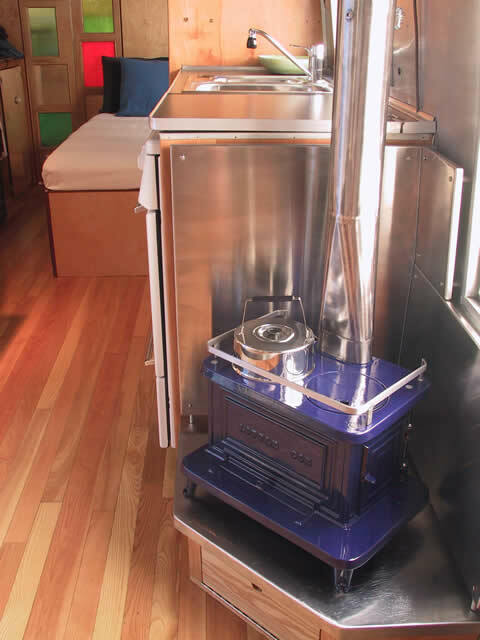 I don't understand all the fear behind wood-stoves in travel trailers? I have grown up with unsafe wood-stoves in our house and coals popping out onto the carpet, never once had any issues. Fire seems less dangerous than propane. Do people forget that a lot of older trailers had wood-stoves? From my research airstreams are out of the question for winter living. I don't want the added stress of constantly worrying about my pipes freezing in the winter. And yet there are more than a few people that do it. I think a lot of people would like a well insulated rv. On looking at the specs of the Arctic Fox trailers, however, the weight of the double pane glass and the slides add a lot of weight. I don't want to tow a trailer over 10k pounds. Aside from the extra gas needed, you might need a special driver's license from the DMV. I think you could buy an awful lot of fuel with the difference in cost; A$ verses Arctic Fox. So the towing cost is not an issue for me. But, I have a TV big enough to tow the AF. You should also consider the problems with condensation. I believe the AF would be better suited for a wet climate since it is built for the colder climates. In either case, proper ventilation is a must. Once mold starts to grow, it is hard to get rid of. I want something built like a tank to live in, i'm not a vacationer i'm a genuine hill billy looking to keep myself dry. I would suggest a shipping container or two with spray on foam wall insulation. make one unit a bath; a second the sleeping area; a third can be the kitchen. when $ permit; get another for an entertainment area. You can stack them if you desire; they are bullet proof; rain proof; beauty proof and can easily be moved from place to place. All it takes is a container type truck; you can get lengths from 20ft up to 53; weld'em together for width; put garage type doors in them or whatever. I keep telling everyone I know that shipping containers are the answer to the homeless problem as well as the occupy "whatever" group. hose 'em out to clean them. the real beauty to them is that they are ugly, and cheap; no one will bother them and if they get graffetti on them, it doesn't matter. Christopher Deam may even do one for you if invited. I would suggest a shipping container or two with spray on foam wall insulation. make one unit a bath; a second the sleeping area; a third can be the kitchen. when $ permit; get another for an entertainment area. You can stack them if you desire; they are bullet proof; rain proof; beauty proof and can easily be moved from place to place. All it takes is a container type truck; you can get lengths from 20ft up to 53; weld'em together for width; put garage type doors in them or whatever. I keep telling everyone I know that shipping containers are the answer to the homeless problem as well as the occupy &quot;whatever&quot; group. hose 'em out to clean them. the real beauty to them is that they are ugly, and cheap; no one will bother them and if they get graffetti on them, it doesn't matter. Christopher Deam may even do one for you if invited. I actually thought about this once before. The older ones are fairly cheap but they have seen much salt water and begin to rust just after a few years. Lots of bad chemicals in those things. Also you'd need land to park them. Great idea though. If I had land i'd be building a cob house. It's sad to see so much land that goes to waste. Millions of acres just sitting there for people to live on, and nothing happens with it. No denying the Airstreams are the runway model for travel trailers. But the Bigfoot is the choice for year round living if colder weather is part of the plan, not to mention leaks and eventual rotten floors. My feelings exactly! Hell, most of the "cabins" I have lived in had very unsafe woodstoves and they did just fine. I am pretty conviced my Streamline is far less flamable! I have read all the concerns, and really, just be smart! crack a window..., feel the surrounding stuff and make sure they aren't getting too hot, install a carbon monoxide monitor, and bam, good to go. (my 2 cents). I have my new woodstove and I am installing it later this month.